Would love to win Twice Tempted. Thank you! I would love to win a copy of Once Burned. Thank you! Would love to win the paperback of Twice Tempted. Thanks. I usually don't like to read anthologies but I'd love to give Irregulars a try. Also. 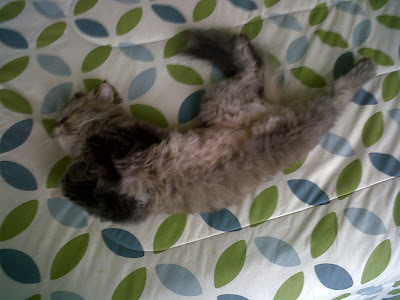 I want to cuddle your cat. I can accept a Kindle gifted book. I've already read the first Vlad and eagerly await the second so yes, please send me Twice Tempted. I started reading Irregulars last night - oh, the freezer - Ew! As far as the giveaway is concerned, I'd love a copy of Twice Tempted. Happy early birthday! I hope you enjoy your weekend! 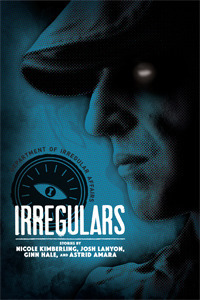 If possible, I'd love the chance to read "Irregulars," please. Please count me in. Thank you! Seeing how much you're looking forward to Twice Tempted, I now have to go check out the first book :) Hopefully, something else we'll have in common LOL. I'd like Twice Tempted to see what Vlad has in store for us. I hope you have a fantastic Easter and week off! I would be thrilled with either but my first choice is Twice Tempted since I have already read Once Burned (and all the other books associated). I can't wait to read the 2nd book! Thanks for the giveaway! I would love to win Twice Tempted. I'm anxious to read what happens next! I'd like to read Irregulars!